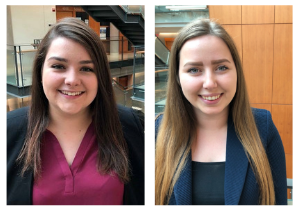 Madeleine Fraser Burke and Madison Longmire are 4th-year Bachelor of Commerce students who were chosen to represent Dalhousie University at the International Society of Certified Employee Benefit Specialists (ISCEBS) Symposium in Boston. The ISCEBS Symposium was an opportunity to learn about the corporate benefits industry and attend workshops and network with professionals within the insurance industry. If you are thinking about working in a particular business sector, gain insight into why Madison and Madeleine believe attending an industry conference is a great learning experience. Both Madison and Madeleine are accounting majors who have developed a passion for the insurance industry through their work term experiences. Madison says that during her time in the Commerce program her interest in the industry has grown. Her family has worked in the employee benefits and insurance industry for years and she has always been curious to learn more. For Madeleine, her interest in the industry began with her passion for mathematics and actuarial sciences. A switch into the Commerce program only increased her curiosity to learn more about the insurance industry and how it is influenced by tax reforms. Aside from expanding her knowledge and the experiences she gained while working for EY that increased her interest in the industry, she says that the conference’s networking opportunities were the most beneficial to her professional and personal development. Although it can be intimidating to get involved in conferences and other extra-curricular activities, both Madison and Madeleine agree that engaging with professionals is important for future career success. If you are interested in getting involved and looking for ways to enhance your career development outside of the classroom, make sure you are regularly checking your Dal email for notifications regarding opportunities for professional growth from Management Career Services.